One year ago, my family and I were hanging out on the warm sand of Kanapalli beach and enjoying the aloha life. 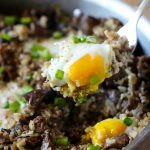 To celebrate our one-year throw back, I’m sharing this One-Pot Loco Moco inspired by one of my favorite Hawaiian comfort food dishes, Loco Moco. 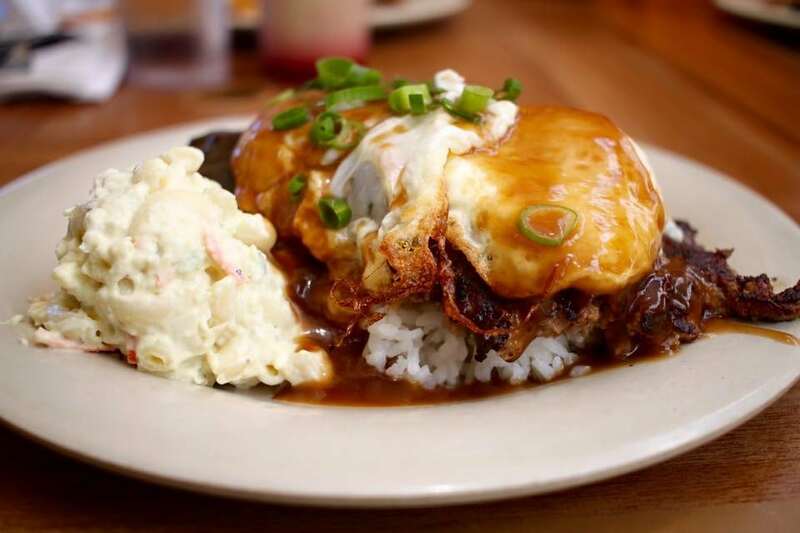 Loco Moco is a must-have when you visit the Hawaiian islands. 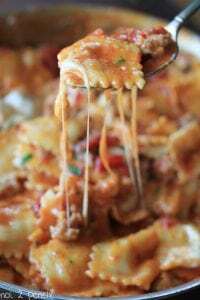 It’s pure comfort food and you can find it on menus all over the islands. It’s a tender meaty hamburger patty, served over a bed of fluffy white rice with a fried egg (or two!) on top, smothered in brown gravy and topped with fresh green onions. The perfect breakfast, lunch or dinner. Here is a picture I took of the Loco Moco at Aloha Mixed Plate in Lahiana, Maui. 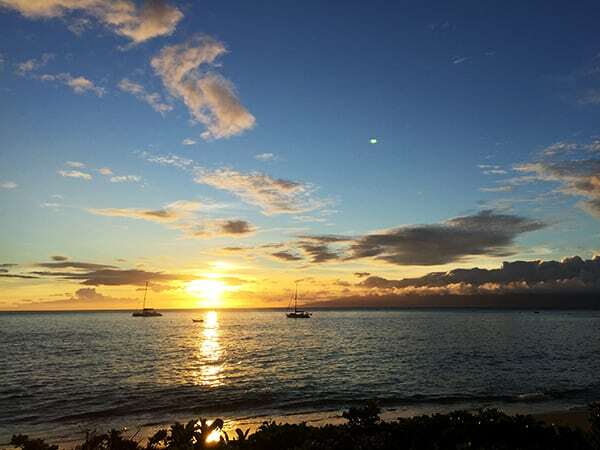 One of our favorite places to eat on the island! Like most mixed plates in Hawaii, it’s served with a scoop of macaroni salad. 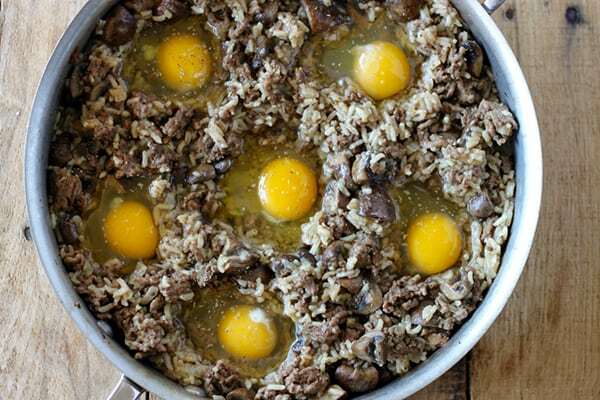 I thought the Loco Moco would translate nicely into a delicious one-pot meal, and I was right. 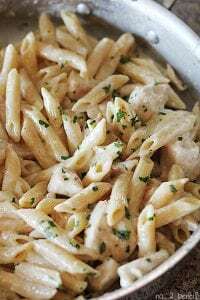 This is a simple, comforting meal that is so easy to make. Start by sautéing a pound of cremini mushrooms in olive oil. Remove mushrooms from pan and set aside to be added back in later. Add a little more olive oil to the pan if needed and saute onions and garlic until they start to soften. Next, add ground beef and brown until cooked through. 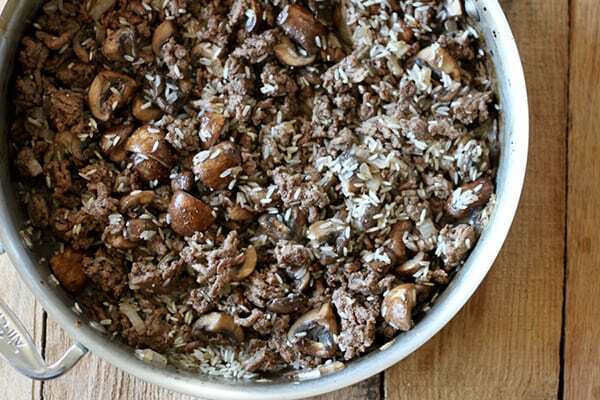 Stir in mushrooms and uncooked white rice. Cook for a minute or two until rice has started to toast. Add low-sodium chicken broth, soy sauce, salt and pepper to pan. Bring to a boil, then cover and reduce heat to low. Cook until rice is tender and has absorbed all the liquid, about 20 minutes. Uncover pot and use a spoon to create wells for eggs. Crack one egg into each well, then sprinkle with kosher salt and freshly ground pepper. Replace cover, increase heat and let cook until egg white is set. In a large saute pan with a lid, add olive oil to pan and cook mushroom over medium high heat. 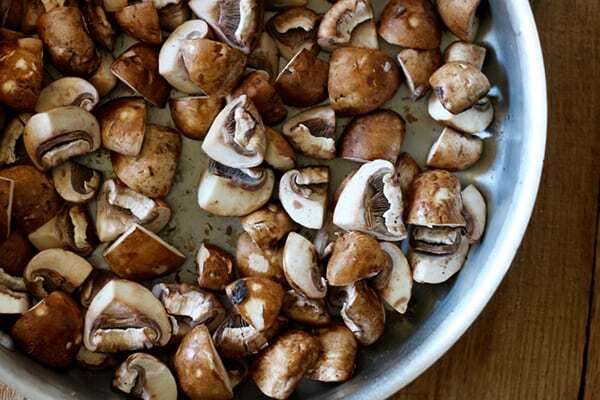 Once mushrooms are tender, season with a pinch of salt a few turns of freshly ground pepper. Remove mushrooms from pan and set aside to be added back in later. If necessary, add a small amount of olive oil back into pot to sauté onions and garlic. 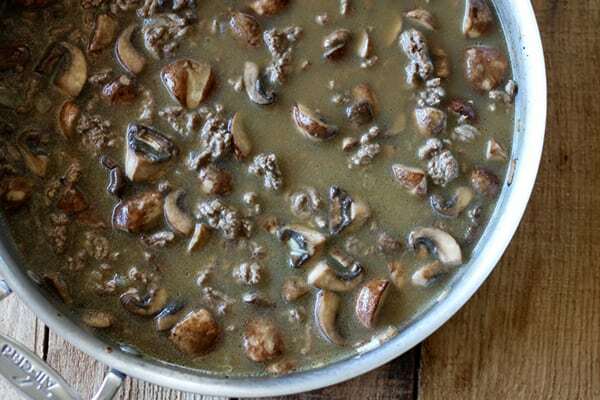 Once onions have started to soften, add ground beef to pan and brown until cooked through. 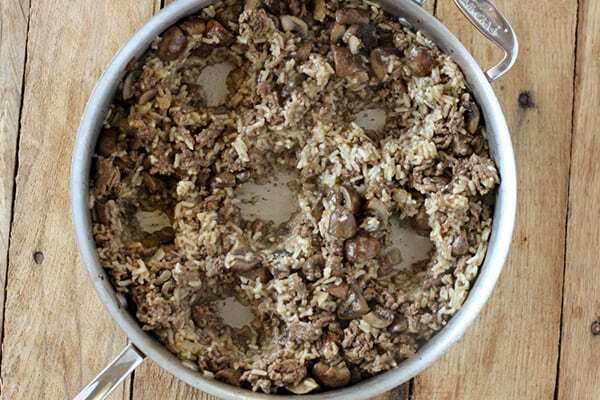 Add mushrooms back into pan along with uncooked rice. Stir uncooked rice for a minute or two until lightly toasted. Add low-sodium chicken broth, soy sauce, 1/2 teaspoon of kosher salt and several turns of freshly ground pepper. Increase heat to high until it starts to boil, then cover and let cook on low until rice is tender and all liquid is absorbed, about twenty minutes. Once rice is tender, remove lid and gently stir. 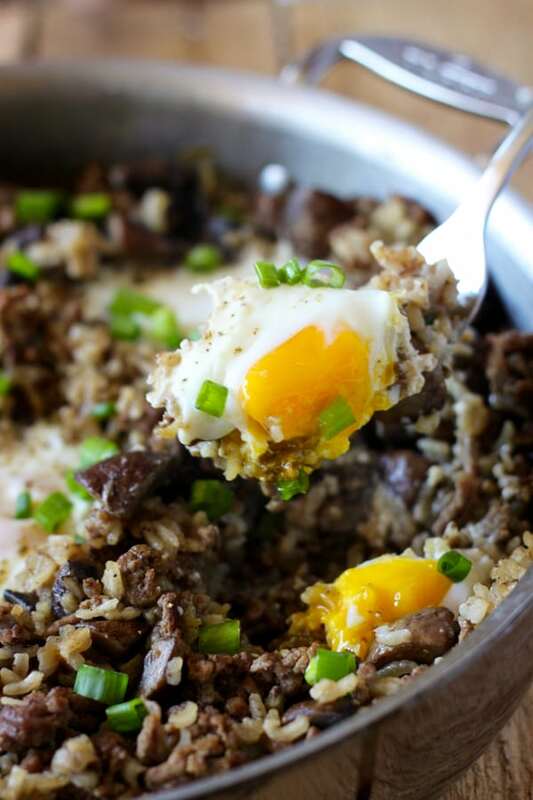 Use a spoon to create wells in the rice for eggs. Crack eggs into wells and sprinkle with a small amount of kosher salt and pepper. Cover and increase heat to medium-high. Let eggs cook about 5 minutes, or just into whites are set. 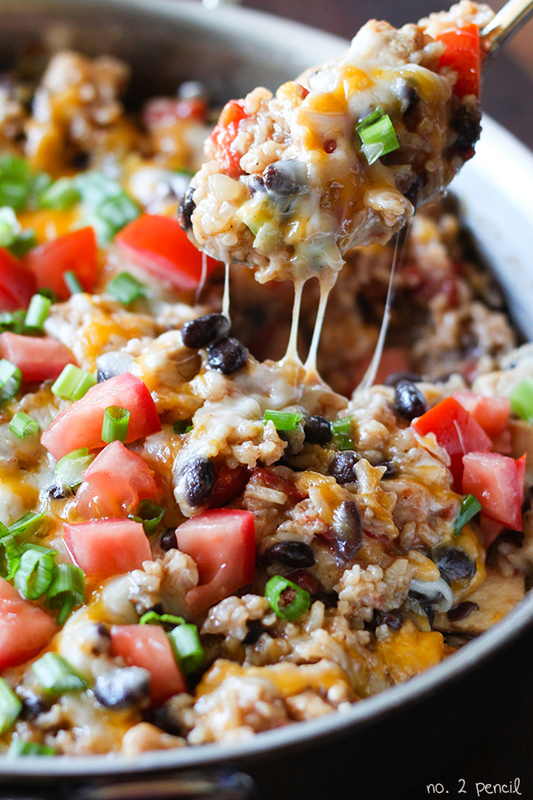 Depending on the size of your pot, you can add more or less eggs and vary the serving size. I’m so glad I saw this on your facebook. I made this for lunch today. I love the mushrooms and green onions in this; I added in some extra veggies. I’ve been wary of cooking eggs in skillet meals because everyone always likes their eggs different–hard, medium, over easy–but this came out beautifully. It had all the flavors of the loco moco I had on vacation and was easier to assemble. I took my eggs out a minute or two earlier, left the others in to firm up, and everyone was happy! This was so good! Thanks for taking the time to comment, Sarah! I’m so glad you guys liked it! 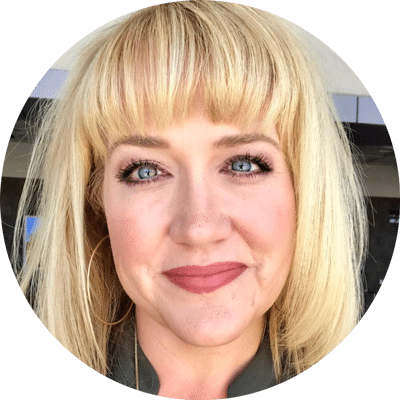 Why do you use chicken broth? I typically don’t like to use chicken broth with beef (or vice versa) since it seems to create an odd flavor. However, I’ve never had Moco Loco so I don’t know if there’s would be something lost if I decided to use beef broth instead. I think either will be fine! I was actually on the fence about which one to use when I developed this recipe. I went with chicken broth because that’s what I would typically use to make a brown gravy and what I usually have on hand. Oh my goodness, YES. 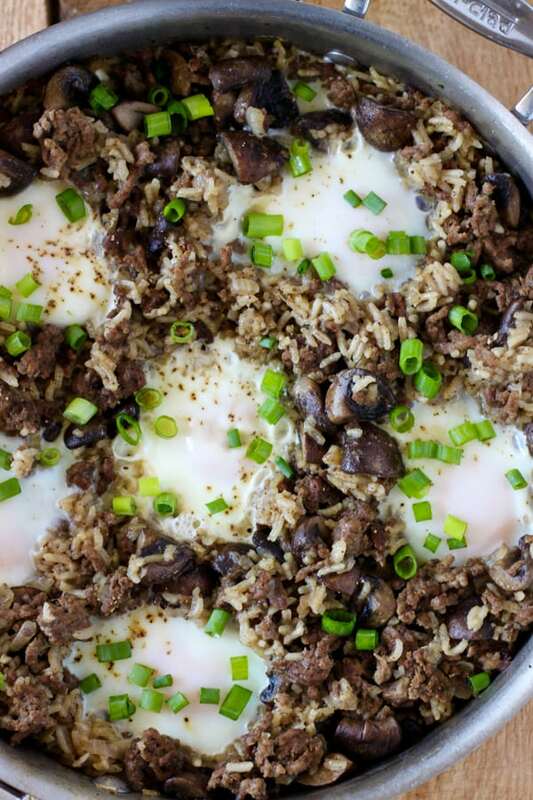 Loco Moco is one of my favorites, and one-pan loco moco is even better! Love it!